Few of us notice curb cuts. And yet they help to make our streets walkable. Before the curb cut spread among U.S. cities, there was a sharp drop to the street at the end of every sidewalk. Fifty years ago, that drop was replaced by a tiny sloped cutout. It first happened in Berkeley, California where a group called the Rolling Quads wanted to navigate the streets independently in their wheel chairs. They convinced the Berkeley City Council to mandate curb cuts and the rest of the story is history. Last week, in NYC, I appreciated every curb cut as I pushed my young granddaughter along in a stroller. However, that is only one small part of what makes a street pedestrian friendly. At the website walkscore,com, you can see if a community is friendly to walkers. Places with a high score had a network of nearby amenities. They had pedestrian friendly block lengths, block layouts, and walk times. They might also have had buildings with entrances and exits that facilitated pass through traffic. Walking can energize a community. 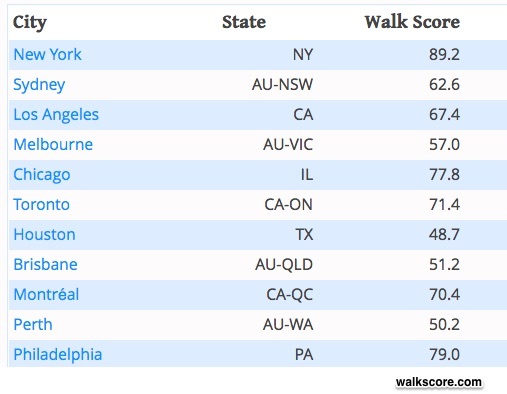 Observing the impact of walking in Melbourne, Australia, one researcher concluded that when a walking score went up from 50 to 100, jobs in the area had an 8% productivity boost. As he explained, walking leads to agglomeration. When we walk, we bump into colleagues, friends, and associates with whom we share ideas. Shopping, we give local storekeepers business. Yes, it is possible that the statistics confirming the economic value of walking are somewhat incalculable. But still, we can conclude that human capital is affected positively. 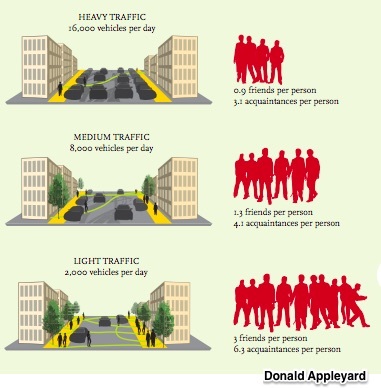 Defined as the knowledge and health that we personally accumulate, our human capital does grow in walking friendly areas. And, seemingly inconsequential, curb cuts even make a difference. My sources and more: When two seemingly disparate podcasts converge, it is such fun. For me it was “Curb Cuts” from 99percentinvisible and then the walking talk from The Money (ABC Australia). Because The Money podcast mentioned walking scores, that was my next stop as was this Melbourne study. And finally, for a quick readable summary of the topic, MSN has it.